Refreshing Daily in God's Word: Daily Devotion: Do You Know Who The First Professional Baseball Player Was? 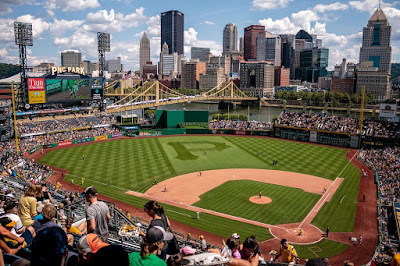 Daily Devotion: Do You Know Who The First Professional Baseball Player Was? Al Reach was baseball’s first pro player. In 1864, hard-hitting second baseman Al Reach left the Brooklyn Atlantics for the Philadelphia Athletics so that he could earn $25 a week. Fans objected to a player taking money for the privilege of batting a horsehide sphere with a wooden stick. But Reach set a precedent: He became the first salaried baseball player, thereby transforming an amateur sport into a professional one. Before Reach joined the A’s, outstanding athletes had been given money under the table – shares of gate receipts, gifts, and promises of political favor. By the end of the decade, baseball players were openly earning as much as $1,400 a year. Now, while $1,400 doesn’t seem like a lot by today’s standards, it was a great amount in the 1800’s. But whether you are making millions a year or fourteen hundred, it really doesn’t matter what one gains on this earth if they haven’t gained Jesus Christ! ✞Richness of Christ or richness of the world…which do you choose?